Since September, I have been enrolled in a graduate-level class in Liberal Studies (like Humanities, but even more broad). During this time, I have had the opportunity to read, and grapple with, and sometimes hate, a variety of canonical writers and texts, from Sophocles to Henrik Ibsen, from Euripides to Margaret Atwood, from Plato to Thomas Mann, from Freud to Henry James, from Genesis to Lucretius, and on and on and on. When it comes to by-gone thinkers (especially European males), my library is fairly well-stocked for a single semester of reading. As a broad (albeit Western-heavy) foundation for further study, the ideas I’ve encountered this semester have been a lot to take in. Before we had an entire planet’s worth of knowledge (and also, let’s face it, baseless opinion) at our fingertips, people used to sit around reading books and THINKING about things, and proposing ideas for the way the world worked based on nothing more than observation and deduction. Long before microscopes, Lucretius (ancient Roman, author of massive didactic poem The Nature of Things) knew that matter was made of atoms, which could neither be created nor destroyed. He also thought that while you slept your “soul atoms” left your body and floated around in the ether until you woke up, but hey, he made some pretty interesting hypotheses based on what he could observe at the time, and some of them (like his ideas about genetics) were pretty on the money. What’s significant to me is not whether these philosophers, psychoanalysts, poets, and/or scholars were right or wrong, but simply that they took the time to think deeply about the world and to try to answer big questions: what is the universe? What makes a human being? What is a person’s obligation to the State, and vice versa? If we’re becoming more “civilized”, why are people so unhappy? What is the nature of love? Of beauty? Of “truth”? Despite the almost total exclusion of women and working class men from the intellectual sphere at the times when most of these thinkers were writing, encountering these works, I almost long for the European “salons” of the late 18th-century, where educated people would meet to talk and argue about the big ideas, and a time when intellectual conviction about the way the world is and ought to be was enough to spark a revolution. 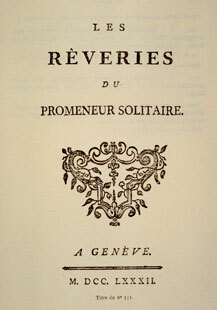 Which brings me to the subject of my penultimate class for this semester, and also (technically) of this post: the autobiographical Reveries of a Solitary Walker by 18th-century Swiss writer and composer Jean-Jacques Rousseau. Rousseau lived a rather sad and tumultuous life, eventually cut out of his Parisian intellectual community for being too religious and prevented from further publishing or public speaking by the French government for not being religious enough (he believed he did not need the Church to have a relationship with god), plagued by chronic health issues throughout his life and by his own paranoia and melancholy in his later years. These troubles, combined with deep convictions resulting from intense self-reflections, forced Rousseau to adopt a quiet life of contemplation and comparative solitude (though not quite as solitary as Rousseau would have you believe–it’s true that he was denounced in the circles where he wanted to be welcome, but he did have many visitors and a great deal of correspondence with fans and well-wishers, in addition to a very supportive wife). ANYWAYS, Rousseau, in his now quiet and isolated life, sought to find comfort and satisfaction in himself, taking long walks in the countryside during which he would think many thoughts. The ten “walks” which comprise his Reveries are a collection of some of these thoughts. Though I must confess that I have neither completed all of Reveries of a Solitary Walker yet nor totally gotten on board with the way the Rousseau depicted in this text is (his pious brand of self-pity is a bit much, even though I know he had his reasons), there’s something I really really like about the fact that this book exists. Because Rousseau makes THINKING important. Not so you can win an argument, or look clever, or sell a bunch of books. But just so that you can know yourself, and your own moral compass, and how you want to be in the world. As Rousseau “walks” (or rather writes, though the reader is meant, I think, to assume that each section topic is something the author pondered as he rambled around the countryside), he discusses human conundrums like how he came to his unpopular religious beliefs (through “…the basic principles adopted by my reason, confirmed by my heart, and bearing the seal of my conscience uninfluenced by passion” he says in the Third Walk), whether or not it’s alright to tell lies if they don’t advantage you or hurt anyone else, and the uncomfortable moral state people find themselves in when good deeds done freely become obligations done resentfully. I guess I like Rousseau because although I don’t go on too many long excursions, commuting via public transit has provided ample time for walking and thinking and I often do find myself parsing out moral conundrums like the implications of giving a donation to an organization like the United Way from the comfort of my own home but refusing spare change to a person on the street, or of owning a car even though I know how much damage the extraction, transport, and burning of fossil fuels is doing (or at least, I know that I don’t even know how bad it really is). And sometimes I just find myself thinking about anything, because I have a 20-minute walk from the station to my apartment, and nothing better to do with the time. Today, for example, I thought about how I would hypothetically describe what “seeing” is to a person who was born completely blind and has never experienced it themselves (I settled on saying “Sight is a way of knowing where objects are, and how big they are, and what shape they are, and whether they are moving, without having to touch them or hear them,” but I’m not totally done with that one yet). What Rousseau does for me is bring home a little epiphany I’d had earlier in this course which is that philosophy doesn’t have to be some lofty process that requires a great deal of book-learning or a knowledge of Greek. It’s just a process of trying to reason out what’s going on within and outside of you, and I realized that when I was a kid, I USED TO PHILOSOPHIZE ALL THE TIME. I grew up in an agnostic household with a father who occasionally turned car rides into mini lectures about whatever (one where he tried to explain to five-year-old me why god wouldn’t be a boy OR a girl comes to mind) and whose answers to my questions about religion were non-dogmatic enough to leave me to make up my own mind about the spiritual realm (except for knowing that god, if god exists, is NOT a boy OR a girl). This meant that I had the freedom to float around in the bathtub while my impatient family members knocked on the door, wondering if I was maybe the only REAL person in the universe (because I couldn’t hear anyone else’s thoughts), or if the fact that I have now existed means that I am infinite (because now there will always be The Time Before Lauren and The Time After Lauren, regardless of how long my physical life is), or whether the weird gyprock spackles on the ceiling were actually a skeleton hoard coming down from the sky on horseback with spears and arrows (probably not but it looked that way from where I was) or whether I was really here at all or whether the whole entire universe is inside a single atom. My commute notwithstanding, I’ve realized I don’t have as much time to just think about stuff anymore, and though in many ways it’s because I’m now more responsible, and I’m doing and learning lots of cool stuff instead of just being idle, I miss it.